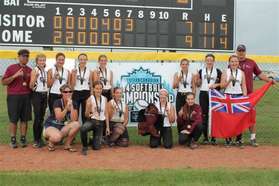 Softball Manitoba has announced that the South Interlake Phillies 14U have been selected as recipient of the Eugene Michalow Award as top minor team in the province for 2013. The Phillies won Silver at the Provincials and then took Gold at the Western Canadian Championship. Great job Team!!!! The Phillie Peewees are 2013 Western Canadian Champions. The Peewees ran the table in the 6 game round robin, by scores of: Phillies 9 Manitoba Thunder 0, Phillies 9 Saskatoon Raiders 2, Phillies 15 Prince Albert Aces 6, Phillies 12 Saskatoon Lasers 5, Phillies 11 Alberta River City 10, and Phillies 8 Calgary Kaizan 4. The 6-0 record put the Phillies in 1st place for the playoff round where they met the host Prince Albert Aces. The Phillies suffered there 1st loss as they were downed 11-4, putting them in the must win position to continue. Interlake did not disapoint as they staged a come from behind win, as they were trailing 6-1 and pulled off a 7-6 win in their final at bat, The Peewees then met Prince Albert in the Gold Medal Match and came through for a 9-7 victory to claim Gold and the 2013 Western Canadian Championship. Brielle Cara was named top pitcher in the round robin and Tatum Lindley was named MVP of the playoff. Great Job Team!!!! The Phillie Peewees had a fairly successful weekend as they split a double header with Brandon Magic and then tied and defeated the PHillie Bantams at Quarry Park this weekend. Brandon opened game 1 with a 3 run inning as a leadoff walk and a hit batsman scored from a single and another hit scored the 3rd run. Phillies answered with 1 in the bottom of the inning as Gillian Kerwin drew a walk stole 2nd and then scored on a Brandon miscue. A leadoff triple and an error put Brandon up 4-1 in the 4th, but the Phillies stormed back with 2 in the 6th to make it 4-3 as Palmer and Stafford scored. An error and a single put Brandon up 5-3 in the 7th, but Phillies couldn't mount a come back and fell 5-3 in the opener. Phillies managed only 3 hits as Lindley doubled and Schneider and Palmer singled. Phillies had 3 walks. Lindley and Schneider handled the pitching duties allowing 6 hits while fanning 9 and issuing 3 walks and 1 hit batter. Game 2 saw Brandon again jump out to a 2 run lead, but Brielle Cara put 1 up for the Phillies in the 2nd as she stole 2 bases including home to put the Phillies on the board. Kerwin added a run in the 3rd to tie the game. Brandon made things interesting in the 5th as after a leadoff strike out they loaded the sacks on walks, but Cara refocussed and got 2 comebackers to the mound and ended the threat. In the 6th the Phillies went ahead as Holod and Fines drew walks and then scored to make the score 4-2. Brielle Cara tripled and scored in the 7th to add an insurance run. Phillies win 5-2. Cara and Shewchuk struck out 8, and allowed 3 hits and 3 walks. Phillies had 4 hits with Shewchuk, Kerwin, Cara, and Stafford getting 1 each. The Peewees also had 6 walks. Sunday the Peewees met The Bantam Phillies and came up with a 12-12 tie in the opener of a mistake filled game. Errors, poor decisions, added up with a few hits and a 4-1 lead in the 4th evaporated as the Bantams took full advantage of the Peewee miscues. The Peewees did not fold but kept chipping away, highlighted by a 2 RBI homerun blast from the bat of Emma Stafford and trailed 12-11 at the bottom of the 7th, and then rallied and managed the 12-12 tie. In the 2nd game the Peewees jumped out to a 2-0 lead as 2 walks and a hit batter loaded the bases and Cabral and Schneider racked up RBIS. The Bantams made it 2-1 in the bottom of the inning but the Peewees came back with 1 as Fines walked and then scored on a RBI from Holod. The Bantams again put a run on the board in their half of the 2nd as a hit batter and a single put runners on 1st and 2nd and Mallory Maykutt singled to score 1. In the 3rd Lindley and Shewchuk singled followed by a RBI single from Cara and a RBI from Thoresby and the Peewees led 6-2. Kerwin and Fines both singled in the 4th and Lindley added a RBI and the lead expanded to 8-2. The Bantams closed the gap scoring 2 in the bottom of the inning, but Cara scored in the 5th to make it 9-4. The Bantams battled back again in the 6th with 2 more. In the 7th Cara slammed the door striking out the side 3 up 3 down for a final 9-6 score. The Peewees pounded out 13 hits with Gillian Kerwin getting 3, Cara and Schneider had 2 each and Lindley, Shewchuk, Cabral,Fines Holod and Proven adding 1 each. Phillies also drew 4 walks and had 2 hit batters. Shewchuk and Cara gave up 6 hits, fanned 7, walked 3 and hit 2 batters. Throughout the 2012 season, the U14 team played 18 regluar league games, particpated in 4 tournaments and attended provincials. The girls showed steady improvement and development throughout the year! The U14 Phillies team participated in The Smitty's Early Bird Classic on Mother's Day weekend in Winnipeg. In mid June, we participated in the International Classic Softball Tournament at John Blumberg Softball Complex. 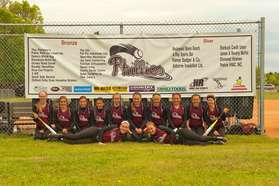 The Phillies participated in the Grand Forks Express Fastpitch Tournament on June 24th, and were the Consolation Champions! Then we traveled to Sioux Falls, South Dakota to participate in the 35th Annual Ringneck International Invitational Tournament July 6-8th. The team wrapped up the season playing in the U14 A Girls Fast Pitch Provincial Championships July 13-15th at the John Blumberg Softball Complex. The Phillie Juniors are Provincial Champions!!!!! The Phillies won gold at the Provincial Championships held at the Blumberg complex July 14-15. In game one the Juniors defeated Parkland 9-0. Korrie Watt opened the scoring in the 1st as she singled, stole 2nd, and then scored. In the 3rd Watt again led off with a single and stole 2nd, and then scored on Taylor Studler's triple. Brooke Beckett then drew a walk, and Regan Lawrence, Michelle Tremblay, and Nikki Bell all singled to put the Phillies up 5-0. In the 4th Interlake again scored as Watt was hit by a pitch, and Courtney Kwasnitza singled to put 2 on. Regan Lawrence then hit a round tripper and Phillies led 8-0. Kwasnitza tripled in the 5th and scored and the Phillies win on a mercy call 9-0. Regan Lawrence picked up the win, firing a no hitter fanning 11 and allowing 1 walk. In game 2 vs Lightning, Lightning went ahead 1-0 in the 1st and that score stayed until the 5th when Tremblay hit a lead off double. Nikki Bell then reached 1st on a fielder's choice. Watt and Kwasnitza then drove in the runners and Phillies led 2-1. Lightning tied the game in the 6th, and the 7th despite some drama, was scoreless. Lightning's 1st two batters hit safely to leave runners at 3rd and 2nd with none out. A popup and 2 strikeouts ended the threat and the teams headed to extra innings. Lightning failed to score at the top of the inning and Phillies came to bat. With Brooke Beckett starting at 2nd in the ITB, Regan Lawrence laid down a sacbunt to move the runner to 3rd. Sam Anderson then walked and Michelle Tremblay hit a fly to centre that scored Beckett to give the Phillies a 3-2 victory. Phillie pitcher Lindsey Dixon allowed 8 hits and 1 walk while fanning 8. Phillies had 6 hits and 3 walks. In a rain shortened affair in game 3 Phillies defeated Eastman 2-0 with Lexa Twist on the mound. As the weather worsened, the Juniors were awarded the Provincial Championship based on their 3-0 round robin record. 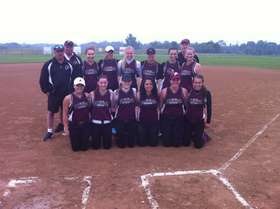 The South Interlake Phillies Senior Women's claimed Silver at the 2011 Provincial Championship. The team will now complete in the 2011 Western Canadians at Quarry Park from August 11th to August 14th. The South Interlake Phillies Midgets claimed Gold at the 2011 International Classic on Sunday with a 3-1 victory over the Smittys Terminators in the Gold Medal Final. Smittys scored 1 in the 1st, and Interlake tied it in the 2nd as Beckett singled and then scored on a RBI from Sam Anderson. In the 3rd Phillies went up 2-1, as Korrie Watt singled, stole 2nd and then scored on a RBI single from Taylor Studler. In the 4th Smittys threatened but stranded a runner at 3rd as a strikeout ended the inning. In the 5th Bre Marcon - Lajeunesse added an insurance run as she singled, stole 2nd and scored on a RBI from the bat of Brooke Beckett. Phillies had 7 hits and 2 walks, while on the mound for the Phillies, Lawrence allowed 3 hits, one walk, and fanned 4. In the semifinal vs Lightning, Sam Anderson broke up a 0-0 tie in the 5th with a solo blast to left to score the only run in a 1-0 victory. Phillies had 2 hits and a walk in the game. Jennie Van Doellen and Lindsey Dixon handled the pitching duties for the Phillies. Van Doellen allowed 1 hit and a walk over 3 innings and fanned 3. Dixon finished up allowing 1 hit and fanned 3. In the 3 preliminary games, Phillies dropped the opener 5-1 to Smittys and then crushed Eastman 24-1 in 2 1/2 innings. Phillies then squeaked by Westman 2-1 to finish 4th in the round robin. This is the 4th time in 5 years and the 5th time in 9 years that members of this Phillies age group have won the International Classic, with past wins including 2003 as Squirts, (where 3 members were still Mite age) 2007 as Peewees, 2008 and 2009 as Bantams and 2011 as Midgets. Even more remarkable is the fact that there was no Squirt Category for the team to play in 2004, and in 2005 the Squirt team played in the Peewee bracket and still made the playoff round. Congratulations PHILLIES!!!!!! Courtney Kwasnitza from the Bantam Phillies has been selected as a player for the JUNIOR TEAM CANADA team which is slated to play in a world tournament in the Czech Republic in August. Courtney was selected from one of three identification camps held across Canada. Courtney was the only Manitoban selected to the 17 member squad which is made up of fifteen 1993 players and two 1992's. Courtney is a catcher/infielder with the Phillies. Kwasnitza has played with the Phillies since 2003. The coaching staff, players and whole organization couldn't be prouder of the accomplishment. PHILLIES WENT UNDEFEATED AT THE EARL MCNICHOL CLASSIC OUTSCORING THE OPPOSITION 52-3 IN 5 GAMES. Several Phillie Bantams participated in the Junior Team Canada tryouts in Saskatoon on June 6. Good Luck Girls!!!! The Bantam Phillies captured the Int'l Classic for the 2nd straight year, going 6-0 in the process. The Phillies outscored the opposition 34-5, and had 4 shutouts. The Bantams did not surrender a earned run in the tournament. This is the 3rd consecutive win for the Phillies having won the title as PeeWees also. Congratulations Girls!!! 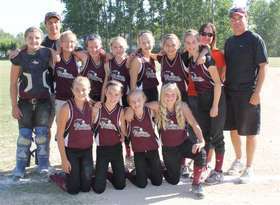 South Interlake Phillies Girls Fastpitch Softball are from the Interlake in Manitoba, Canada. Our home diamonds are located at Quarry Park in Stonewall, Manitoba, which is located approximately 15 minutes north of the Perimeter Highway off Highway #7. The South Interlake Phillies will be in their 15th year in 2009 providing an "A" level fastpitch program. The teams have won numerous Provincial and Western Canadian medals have competed at the National Level. The 2 age categories will be competing in the Manitoba Ladies Softball Super League in Winnipeg and surrounding area. All home league games and practices are held at the Stonewall Quarry Park facilities. Players wanting information on the Phillies, please send us an email or phone Al 467-9430, Larry 467-2678 or Lyle 467-7690. 1995 saw the start of the Phillie organization. This Bantam team struggled in that first year going 5 wins and 25 losses, but come Provincials they played with heart and tenacity and to their credit they did not finish last as they were in every game but one. The coach Larry Klimpke remembers the highlight as being after the Provincial game vs Brandon when the Brandon coach congratulated him and the team on how much they had improved from the start of the year. Two original players Dan Dalton and Erin Klimpke are still members of the Phillies as members of the Open team. Have any good photos taken over the past THIRTEEN years? We can include them in our picuture gallery. 49 visitors have signed our guestbook.